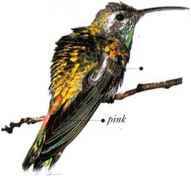 A solitary and territorially aggressive hummingbird, this species lives in undergrowth, in tropical forest and at the forest edge. It feeds on low-growing flowers and also on insects taken from plants or caught in the air. The broad, forked tail is conspicuous in (light. • NliST A little cup nest made of plant down and spider-webs, saddling a small fork or twig, situated low in a bush. • DISTRIBUTION From Venezuela to Brazil and Argentina. 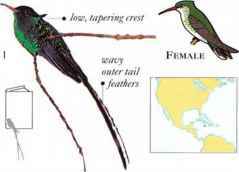 Streamertail w ith its black cap, tapering, pointed crest and long tail streamers, the male of this species is highly distinctive. The Streamertai feeds on nectar and small insects. As a bird of gardens and sunlit forest clearings, it has benefited from forest clearance, which has created more of its habitat. 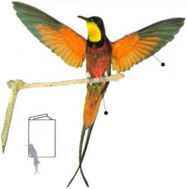 It has a loud, repetitive "tee-tee-tee" call and often performs a sideways-dancing display flight. • NliST A cup nest of plant fibers and plant down, on a level branch, usually in a shrub. A vividly colored bird occurring beside streams in seasonally flooded rain forest, the Crimson Topaz is rare within its range. It feeds in middle and upper levels of the forest, taking nectar from a variety of flowers and also catching small insects. The glistening plumage is shown off in a frontal display. • DlSTRIBl 1TION Two populations: one from S.K. Venezuela to N. Brazil, Fkmai.e the other in K. Ecuador.